Given that it snowed a couple centimetres in Edmonton last week, it may seem that Spring isn't quite around the corner. But soon enough the sun will be shining and the patio will be calling - at least that's how it felt when I checked out the Spring Menu at Earls! Over the past year I've really noticed a change in the style of food served at Earls. It's no longer the restaurant where you go for comfort food like burgers and fries, it's where you can go and expect craft cocktails and sophisticated meals. For the Spring Menu Earls is making quite the change. There are lots of fresh dishes packed with flavour, and Earls has begun a partnership with Spring Creek Ranch (based out of Vegreville, Alberta) to serve their beef on the menu. The evening kicked off with some of the new and noteworthy cocktails, namely the Paloma ($8.50) and Watermelon Pina Colada ($8.50). I went with the piña colada and loved the added delicate flavour from the watermelon. The rum wasn't overpowering, and I really enjoyed how light and smooth it was. 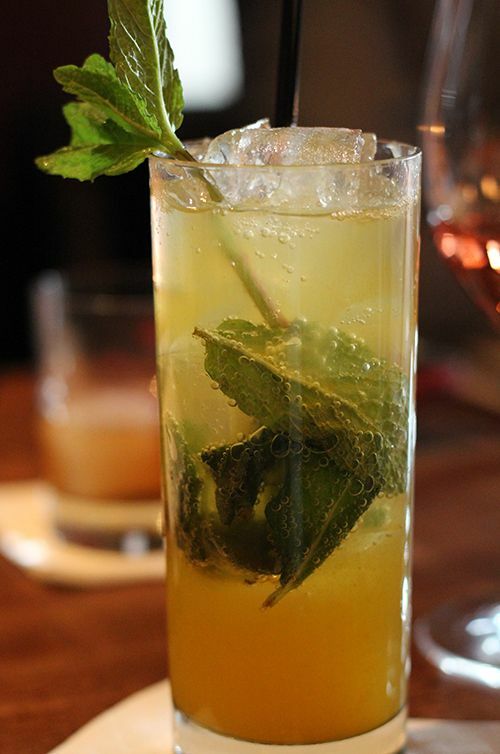 Come summer months, you'll find me sipping on this drink out on the patio. For those of you that do not drink, Earls makes sure you don't miss out on the fun with their list of mocktails. I also had the Passion Fruit Limeade ($4.50). 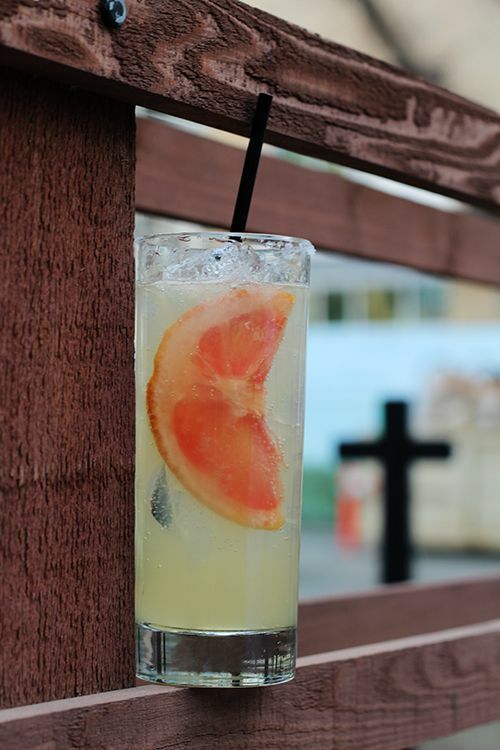 The passion fruit may make you pucker, but it really gives this drink a punch of tropical tang. 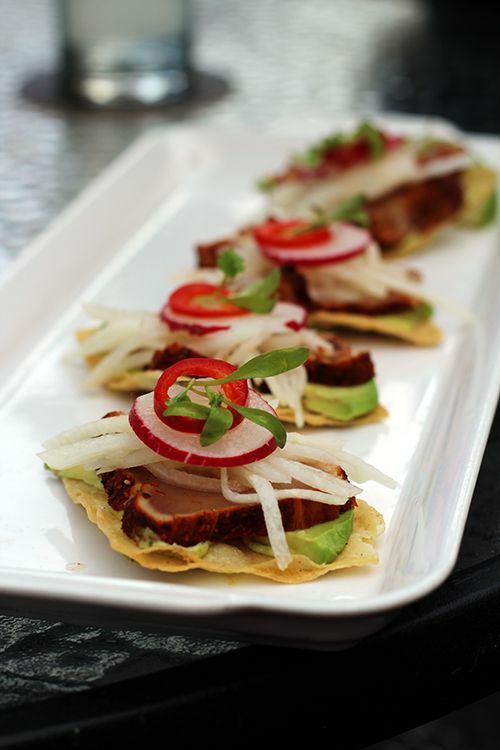 Our night started off with a taste of the Tuna Tostadas ($13/4), where seared chili rubbed Albacore Tuna is accompanied by avocado, jicama slaw, and cilantro aioli served on a tortilla chip. This honestly has everything I want in an appetizer and just screams to be eaten on the patio. The tuna is well seasoned, the pickled slaw gives a sour kick to balance the creamy avocado, there's a slight heat from the chili, and a squeeze of lime juice on top brings it all together. 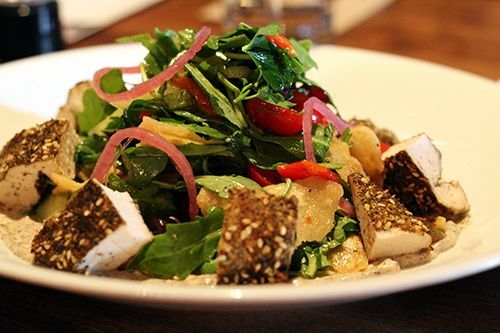 The first dish we tried that evening was a fresh new take on the traditional Fattoush Salad ($17.25). Cucumbers, pickled red onions, grapes, and roasted peppers are tossed with arugula in a preserved lemon dressing and served on a bed of sumac yogurt. The salad is then topped with pita chip croutons and garnished with Italian flat leaf parsley and served with some Moroccan spiced chicken breast. There was smokiness from the peppers, tang from the dressing, and an unexpected but refreshing burst of sweetness from the grapes. It was great to see this Mediterranean salad on the menu, but I don`t know if it`s going to be able to compete with the ever popular Santa Fe Chicken Salad! Next up was the new Oven Roasted Moroccan Salmon ($25), presented with the skin on. 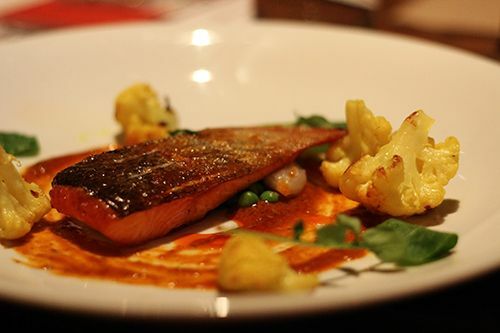 This beautiful salmon sits on a tomato-based chermoula and is served alongside pickled pearl onions, peas, and cauliflower roasted in Persian oil, which gave it a distinct yellow colour. It is quite rare to see skin-on fish served in Alberta, so I loved the rustic presentation and that wonderful crispy skin! The fish was cooked quite well and I would have preferred for it to be slightly undercooked, but the remaining components of the dish were quite flavourful, making this dish a hit. 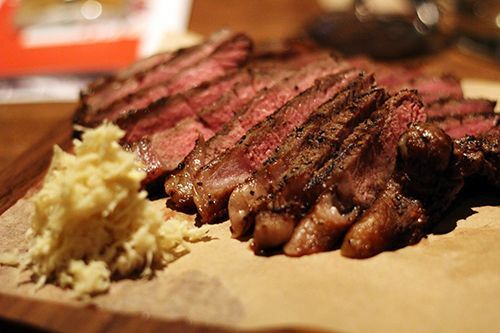 Alberta is well known for beef, so if you have some of high quality from Spring Creek Ranch, you have to show it off! As of April 22, all Earls locations across Canada are being supplied with New York and top sirloin cuts from Spring Creek. We had a sampling of the sirloin served with some fresh horseradish and it was fantastic. Juicy, tender, and full of flavour, this beef really showcases Alberta beef! The course I was most looking forward to trying was the Korean Bibimbap Rice Bowl ($15, additional $ for proteins) served up in a stone pot. 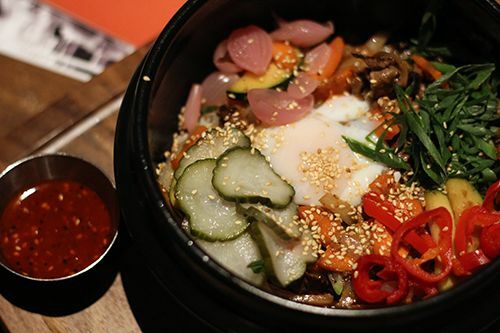 Bibimbap is such a comforting dish, and Earls has put it's own spin on it. The Jasmine rice crisps up very nicely in the hot stone bowl and is topped with marinated Spring Creek Ranch striploin, zucchini, oyster mushrooms, carrots, pickled vegetables (cucumber, onion, hot peppers), and a beautiful soft poached egg. The presentation is absolutely gorgeous, and you can add the housemade sesame chili sauce to suit your tastes. Although not exactly authentic, I quite enjoyed Earls' spin on bibimbap. Crispy rice, plentiful toppings, and spicy sauce to tie it all together makes me pretty happy! 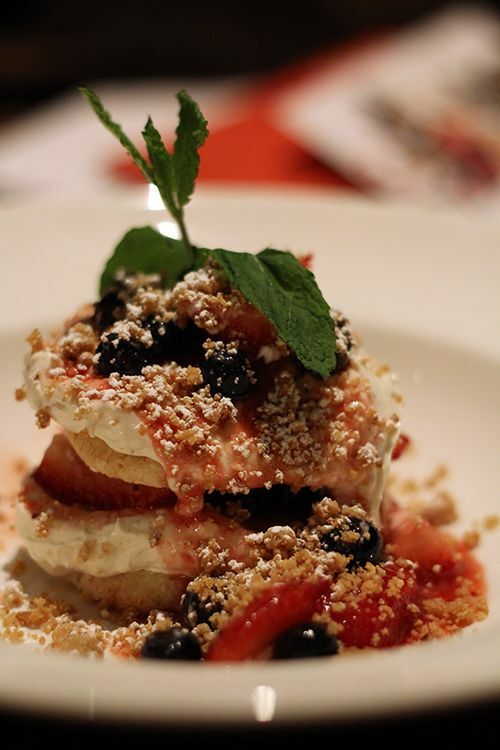 The new Berry Shortcake ($8.75) was our dessert for the evening, and it was delicious. Two layers of cake combined with fresh, seasonal berries, vanilla mousse, and almond crumble made for a lighter version of the traditional dessert. It wasn't too sweet, and I could probably eat two of these on my own. Did I say dinner was over? Not before we all sampled the new Royale with Cheese Burger ($18). One bite and I was sold - smoked cheddar, dry cured bacon, portobello mushrooms, caramelized onions, lettuce, and housemade mushroom ketchup served inside a soft brioche bun. It tastes just as good, if not better, than it sounds! 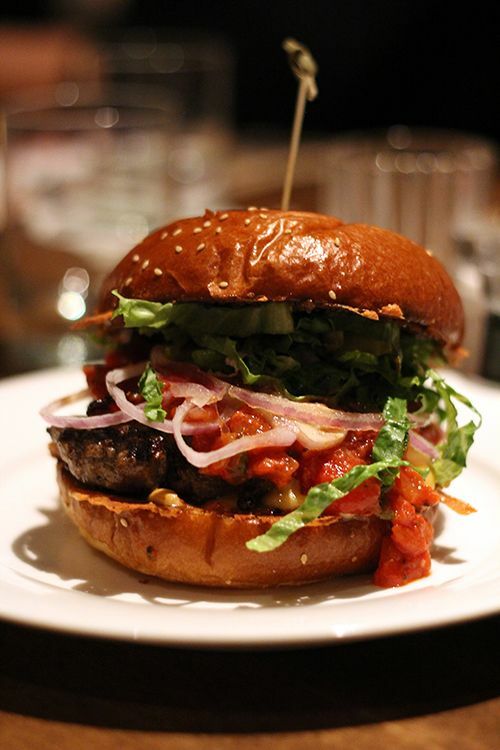 While there are two other new gourmet burgers available on the spring menu, this will definitely be my go-to burger from now on when I dine at Earls. All three burgers are available for a limited time until July 16th. A new season has brought along a new menu with some pretty delicious dishes for Earls. I know that Earls is a go-to spot for many, so it's really nice to see new dishes pop up from time to time. 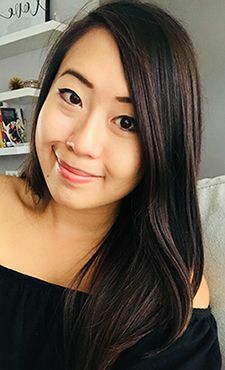 I love that Earls is venturing into different types of cuisine and can't wait to see what the chef collective brings forth for the next menu change. For the time being, check out the new offerings at Earls and let me know what you think! My eyes are on that burger! Oh wow the food looked sooo fresh and colorful and fabulous! I've been enjoying more mock and cocktails and a watermelon pino colada sounds really interesting! I would love a mojito right now and could imagine the lime juice being replaced by other juices! I can't believe it's still snowing in May! How bizarre or not?! Food looked delicious, I'm beginning to like Earls a little more too!